As I posted in the wagon thread I picked up a 2000 BMW M5 for cheap to pull the drivetrain to swap into my wagon next spring/summer. I thought I'd start a new thread for the work I'm doing to the car/engjne. I would love to have started and tested the compression on the engine but unfortunately as I was told by the previous owner, his mechanic wasn't able to set the timing properly after changing the timing guides so it wasn't started and has been sitting ever since. As you can see in the above picture it wasn't all put back together either. Rather than bother to pull the front timing covers off just to set the timing and run it I decided just to pull the full engine and trans out and go from there. 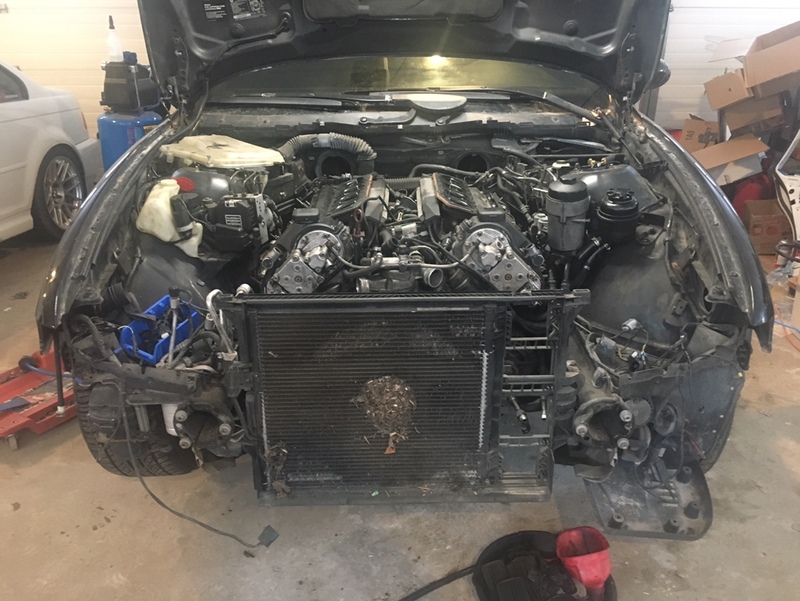 With Black Friday coming up this week I wanted to get the engine out of the car and pull it apart to see what I need to order. I did find however that there's already some very light surface rust on the cams because the valve cover wasn't secured. Yesterday I started getting it ready to remove and as of today I just have 3 bolts to disconnect the driveshaft, 2 nuts on the motor mounts and the A/C compressor and P/S pump it's ready to come out. At first I felt bad about pulling apart this car for parts but after seeing all the rust on it I don't feel so bad anymore. That's all the pictures I have for now but I'm planning on pulling the engine and trans tomorrow and getting it mounted on a stand to start the teardown. wow that rim is toast lol, nice find, looking forward to the build. I like them and even though they're reps they're hard to find replacements so I'm going to see if that place in winnipeg can fix it up. After having to remove part of manifold on each side it finally is free! Didn't have a tire so some insulation had to do. It's so empty. I still need to pull the A/C compressor, power steering pump, steering box and the subframe but I'll leave that until the spring. I'm not entirely sure about the flywheel yet. It's a dual mass flywheel so machining is out of the question. In order to remove the flywheel you need a special T60 torx since the bolts are offset from the holes. I didn't have the special bit and didn't want to pay $60 for so I bought a bit off amazon went to the bench grinder. The rear main seal looks good but it'll still be changed along with the gasket for the cover above it. Upon closer inspection I found the exhaust cam on bank 1 has some wear/grinding marks. It's hard to see but it seemed like every lobe had the same marks. Once I had the VANOS removed I was able to take off the upper timing covers and I was greeted by this... I found 4 pieces of the timing chain guide there. I also found the timing chain tensioner wasn't providing much tension. Next up was the oil pump. First the cover comes off. Then I can get at the nut. Then 4 5mm allen head bolts and it just comes right out. This is the guide that's missing all the plastic. The big U shaped one was staring to come off the metal as well. I definitely have to remove the one exhaust cam but I'm also thinking of removing the entire bank 1 head since the VANOS timing on that was really messed up and while I've looked in the cylinder with a scope and the valves look ok from the ports I'm still slightly worried there may be damage. Good God. Whoever set the timing should have their license revoked. Glad to see you're giving it some very needed love and attention! How's progress coming along in 2019? Have you decided what you're doing with the bank 1 head? This was over a month ago but I pulled off the throttle bodies and everything connected to them to start to remove the heads. I pulled off the bank 1 head and the valve are definitely bent but there isn't as much carbon build up as I expected. There's some horror stories online about carbon build up issues in the M62 and S62 V8's due to the secondary air system used for emissions on cold starts. Definite signs of the valves touching the pistons but it seems extremely minimal and I can still reuse everything minus the head. I realized that I bent the valves myself when I had to turn the engine over to remove the VANOS unit on that bank since it was set so badly. The plan is to clean up the pistons with atf as good as possible. I plan on doing the main bearings now so I'm thinking of changing out the piston rings while I'm in there and have a practically new engine. New OEM valves would have cost close to $800 US so I ordered a used head that came with valves, VANOS hubs, cam gears, timing cover and most importantly cams for $425 US. I can sell the VANOS hubs, gears and timing cover and recoup at least half of what I paid for the head and if I sell my old head as well I think I can break even. When I got the new head I opened up the package and found that one of the studs on the cam caps was bent. Luckily the studs are a removable piece. The exhaust cam timing gear on the back was also bent but again it's replaceable and I have the one from my old head. I wanted to test out the new used head to make sure the valves sealed properly since I didn't have time to mount it to the block and do a leak down test, so I put water over the valves as a preliminary test. Thankfully there were no leaks. I may lap the valves and will probably change out the valve stem seals while I'm at it. Picked up a massive order from the border, over 130 lbs with 142 different part numbers and 364 total parts. Most of the major big pieces to rebuild the engine are in these boxes but I have another massive order I need to make that contains the rest of the o-rings and minor parts needed to finish the rebuild. I also picked up a set of Eibach sway bars since I found them on amazon, brand new for less than half the original price. Last edited by Nabs; 01-28-2019 at 06:12 AM.